Wow, wow, wow! I'm so delighted that you liked it. It looks amazing. That's it! To hell with the flaky skin - I have to give this a go!! It would be great for you to review to see if you love it as much as I do! 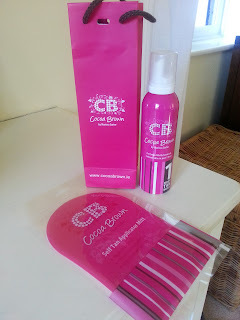 I will NOT be buying any other false tan ever again - this one has won me over big time! So pleased to hear I'm not alone with the lack of tanning leg thing! I put on a little amount this morning because I didn't want overly orange/brown legs - it said wash it off but I have been VERY VERY VERY lazy and naughty and not washed it off yet - the colour has deepened but still it looks perfectly matched with the rest of my tanned body. It's a dry mousse so as soon as it's on it's dry - no John Wayne walking! One question, you say 'leave on' for 1 or 3 hours depending on the depth we desire. So does that mean that we should 'take it off' at some point? Shower or wipe or what? I was TOTALLY lazy and left mine on! It says to shower it off after 1-3 hrs depending on how deep you want the tan. I applied a VERY light coat on my legs and after 3 hrs it was the perfect colour - I waited one more hr and it didn't develop anymore so I left it! I'm not sure you're meant to but I'm lazy like that. I have woken up this morning with the same colour. The biggest thing for me is IT DOESN'T SMELL!!!! I hate to disagree, but I have been working with a friend on making a fake tan product, hers cost more tham 10 to make including really basic packaging. Hers is chemical free, dha based, tans in an instant and lasts for about three weeks. If this one is being sold at Primark for 8 quid, they are buying for 2 to 3 pounds, which means these guys are making for 1 to 1.50, including packaging at say 50p. It will be dye based an not good for you, you can't buy any decent components for £1. There will be no smell if there is no dha to disguise, that is why it doesn't smell. Marissa is the inventor - she's not a reseller. For me, it worked, I liked it. Would very happily review your friends when it's ready! I use St Tropez, but it is considerably more expensive than this little beauty. You say that you left it on, is it a coloured mousse? i.e does it stain bedding or clothing if you leave it on longer than you should. When I use St Trop I have to wear dark clothes and always wash off before going to bed.